Like most of the English-speaking world, I have seen Willy Wonka & the Chocolate Factory. And, like everyone else, I loved it. I have also read my fair share of Roald Dahl books: James and the Giant Peach, Matilda. 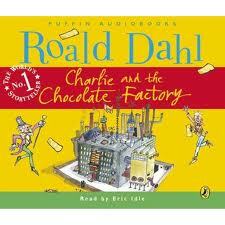 But somehow I never read Charlie and the Chocolate Factory, the book that the movie is loosely based on. If you want to see a movie that’s worse but more closely related to the book, check out Charlie and the Chocolate Factory starring Johnny Depp; it’s not great, but it’s entertaining. But I digress; the book was great. Let’s talk about that. Charlie Bucket is a very poor little boy. His family is so poor, in fact, that he, his parents, and his four grandparents all live in a tiny two-roomed shack. They never get enough to eat and they never get warm. But Charlie’s fortunes are about to change. Willy Wonka, the famous chocolatier, has announced that hidden inside five of his candy bars are five Golden Tickets, and that the children who find these tickets will get to tour his factory and take home a lifetime supply of Chocolate. Charlie soon discovers that there is much more than meets to eye to both Mr. Wonka and his marvellous world. With a beloved classic like this, I pretty much knew what to expect, and I was not disappointed. It was a very entertaining and magical read, filled with interesting characters and vivid imaginings. But what surprised me about Charlie and the Chocolate Factory was just how clever it was. Underneath the childish story was some very witty humor and subtle messaging. The songs of the Oompa Loompas were specifically sharp and cutting, slightly gruesome but poignant. Overall, a pleasant read for a child or an adult, and a book you could visit again and again.